Classic Scottish Plaid Brooch with Antinque look and feel. 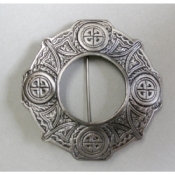 This 3.5 inch Scottish Plaid brooch has an anitque finish with four celtic knots and celtic motif border. Plaid Brooches are the traditional method of fastening the plaid, cloak or shawl at the shoulder.